Ralph Dublikar is a founding member of the law firm of Baker, Dublikar, Beck, Wiley & Mathews in 1986, where he has served as managing partner. For the past 42 years, Ralph has represented various clients, including but not limited to individuals, businesses, insurance companies, nursing homes, medical professionals, attorneys and veterinarians throughout the State of Ohio. Ralph's primary emphasis is that of civil litigation, where he has tried over 150 jury trials to verdict. In addition to his civil litigation and trial practice, Ralph also is highly regarded as an experienced and knowledgeable attorney in the area of adoption law and probate law, having handled close to 100 adoptions over the past 20+ years. In addition, Ralph also has significant experience in the defense of trucking companies, insurance companies and various businesses in cases involving personal injury, wrongful death and breach of contract. Ralph has been very active in the community, local bar association, school and church. 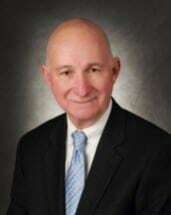 Ralph is Past-President of the Stark County Bar Association (2002-2003) and has served on various committees. He is a past member of the Grievance Committee and Executive Committee and is the chairman of the Disputed Fee Committee, and a member of the Courts, Trials & Assignments Committee in which he is past-chairman. In addition, Ralph is Past-Chairman of the Board of Trustees of St. Thomas Aquinas High School, where he also served as an assistant baseball coach from 2002-2007. He also received the St. Thomas Aquinas Distinguished Service Award for 2009. Ralph was born in Niles, Ohio, on August 31, 1949, and was admitted to the Ohio Bar in 1974. He is a graduate of Niles McKinley High School (1967); Xavier University (1971) where he earned a bachelor of arts degree in political science; and University of Cincinnati Law School (1974), where he was a member of the Law Review. Ralph served as a judicial law clerk to United States District Judge Timothy S. Hogan from 1974 to 1976, at which time he came to Canton, Ohio, to begin his private practice. Ralph is a member of the American, Ohio and Stark County Bar Associations, the Ohio Academy of Civil Trial Attorneys, and the Defense Research Institute. Ralph has been married to his wife, Nancy, for 42 years, has four children and ten grandchildren, with the eleventh soon expected.